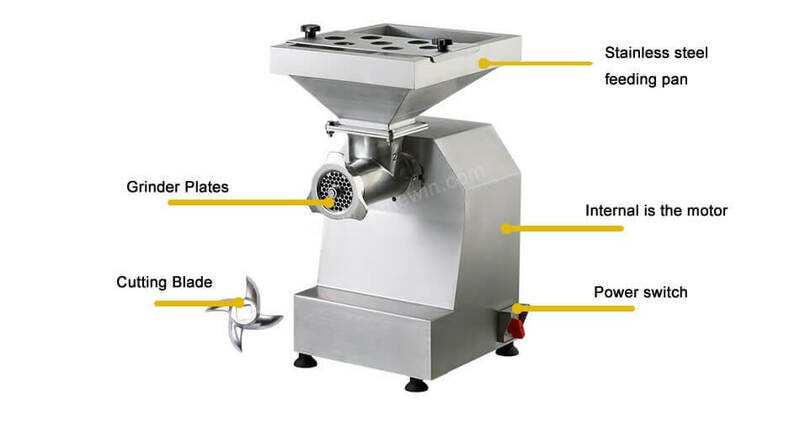 The meat grinder is a meat processing equipment with a wide range of versatility in the meat production industry. The utility model relies on the screw to push the raw material meat in the hopper box to the pre-cutting plate, and the rotary plate of the screw is used to make the orifice plate and the reamer relatively operate, thereby cutting the raw meat into a granular shape, thereby ensuring the uniformity of the meat filling. Different types of meat fillings can be achieved by different combinations of orifice plates. 2. The machine is cleaned and dried, and the meat grinder is placed on the plane. Fourth, the meat will be better after the frozen in the refrigerator, before removing the meat, remove the skin, meat and bones, and then cut into strips (about 2cm wide), pay attention to the meat cannot be cut too much, so it is not convenient to enter the meat, add the meat from the feed port, then turn the handle clockwise to start the meat. This entry was posted in Meat Grinder. Bookmark the permalink.